You can make a direct contribution to the advancement of scientific knowledge by participating in a research study. Studies seeking participants are listed below. This research study investigates the effects of a mind/body practice called yoga nidra on brainwave patterns, heart rate variability, and respiratory rate as possible indicators of the ability of this practice to induce sleep. 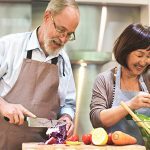 Are you a healthy man age 50-72? NUNM is conducting a research study to assess the impact of a nine-week diet and lifestyle program on the quality of life, symptoms, and methylation-related biomarkers related to risk for chronic inflammation and cancer.